Photos demonstrating appropriate and inappropriate behaviors help to teach and remind individuals how to behave at home, school and in the community. In addition to photos of positive and negative behaviors, the CD contains pre-made token boards and behavior charts that help students to self-monitor their behavior. Also included on the CD is a great feature which allows you to place a universal no sign on top of any photo. 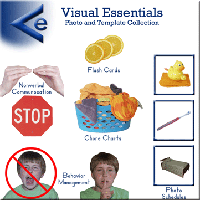 Visual Essentials includes sign language, community signs and photos that can be used to teach vocabulary or in picture exchange programs. The following categories of photos are available: animals, attributes, bad behavior, bathroom, bedroom, body, chores, clothing, emotions, food, good behavior, health, holidays, money, nature, objects, outings, places, prepositions, school, sign language, sports and leisure, street signs, time, toys, verbs, and vehicles. Included on the CD are many pre-made schedules for everyday routines related to chores, errands, grooming, school activities and toileting. In addition to using the pre-made schedules, you can make custom schedules with a combination of Visual Essentials photos and your own. A computer running Windows 98 or higher, including Windows 7, or Mac OS X 10.2 or higher, a CD-Rom drive and a printer. 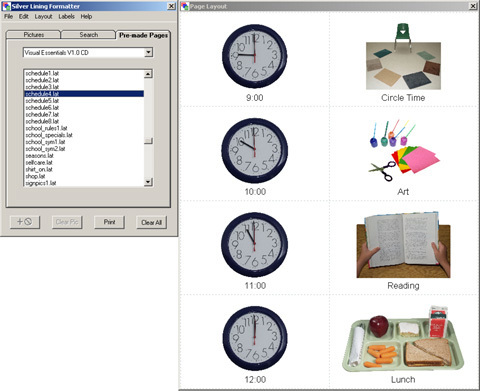 Included on the CD is a variation of the software program which comes with Picture This... Pro. The software allows you to search by word, choose custom card sizes and text, or use the Pre-made Pages panel to easily select from hundreds of pre-made schedules, checklists, token boards, chore charts, self-help pages and behavior charts. 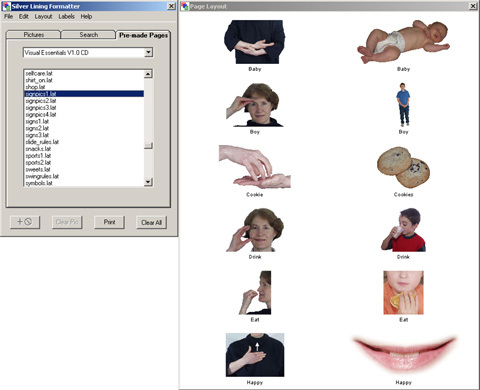 These pages can be printed as is or customized to fit the user's situation.